Your alarm clock is a bluebird. Your commute might involve a bicycle. Your dream is your life. LAND HERE. You crave the sight of rolling hills and the smell of fresh-baked bread. You long to simplify. LAND HERE. Suburban sprawl doesn't inspire you. You’d happily trade the sound of morning traffic for rustling trees. LAND HERE. Imagine a place where evenings are lit by fireflies, not cellphones. A place close enough to the city to remind you how far you’ve come. LAND HERE. Imagine a place where nature inspires art, and creativity is second nature. Where your salad was just picked by your neighbors. You are friends with your grocer, your florist and your planet. LAND HERE. Perched on a hill above town and surrounded by nature, Highcroft Ridge is sustainably designed and filled with world-class exterior living spaces and inspired apartment interiors. At the edge of historic Simsbury Town Center is the stunning boulevard entry into The Powder Forest, its expansive brownstone walls and flowering trees beckoning you upward. At the summit you will find Highcroft Ridge with its inviting village feel, and NEW Highcroft Rise, featuring a fresh phase of offerings to enhance your lifestyle. Close enough to the city, to remind you how far you’ve come. 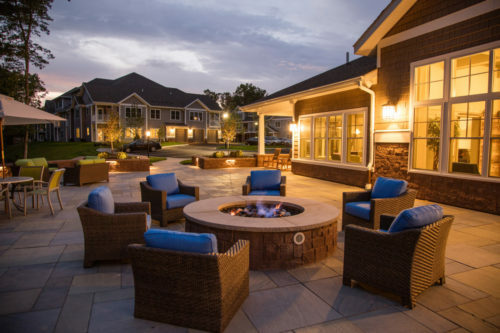 The Pavilion is a new, highly anticipated amenity at the end of the Highcroft Rise cul-de-sac, with an inviting outdoor fireplace, grills, and a large social gathering space. A perfect place for relaxing with friends or having a barbecue. 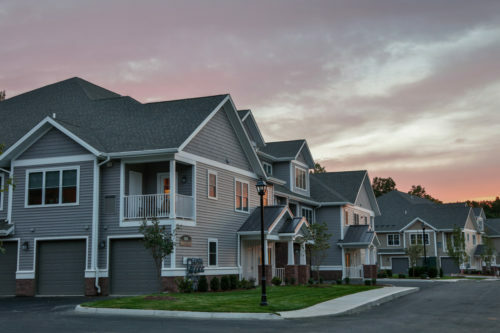 Highcroft Lodge, the award-winning resident center, features a lounge, gathering rooms, business center, game gallery, and entertaining kitchen. The Fitness Center offers cutting-edge weight training, cardio-fit, and stretching equipment. The Lodge leads outside to a refreshing, saltwater pool with loungers and cabanas, and boasts a large sunning terrace. The patio features covered porches, an outdoor grilling kitchen, bocce court, and a relaxing fire pit. There are also plenty of other spaces around the property to enjoy nature or entertain and unwind, such as the Tot Lot, multiple Grilling Areas, and in the Village Green.